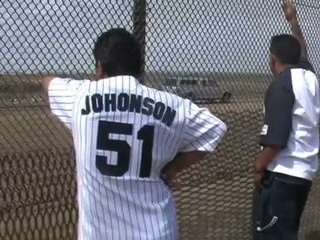 In 2007 I made a short film on the Tijuana side of the San Diego border. I called it báwrdər, the phonetic pronunciation of the word “border”. It was interesting to hear people struggle to pronounce the title whenever it was mentioned, as difficult as the concept of an imaginary line that one must not cross. In the film, I featured the people that go to the border to look at the other side through the fence and are intimidated by American immigration officers driving vans quickly up and down the beach, close to the fence. Most striking are the families visiting between the fence along the beach, some just chatting, others having picnics. Separated families, lovers and children sit on two sides of the border, sharing food, documents and letters through the chain-link fence. It has the sense of being in a prison, such as those experienced by weekend prison visitors who chat by telephone or through a hole in a glass barricade. On the Tijuana side, there are restaurants with beachside panoramic views, that are disturbed by the sudden lunge of a speeding immigration van pushing back someone on the border, who may have gotten too close to the American side. People in the restaurants jump up from their meals and everyone gasps. It is a very peculiar group experience. Border 2007 from Victoria Delgadillo on Vimeo.